Sounds familiar? These are some simple to use yet effective Brainboosts to warm up participants during a creative brainstorm. They are playful exercises yet systematic: designed to activate people’s brains and sometimes help make people aware of their own creative thinking patterns so they can consciously work on changing those. This is a great starter exercise. Instead of having participants introduce themselves at the start of a brainstorm session, have them introduce each-other. This is a fun and easy exercise to get people to know each-other, feel comfortable sharing information and pay good attention to what others are saying. Give them two minutes to get to know each other. After this have each participant in the group introduce the other half of the pair they’ve been assinged too. This exercise isn’t just effective for people that don’t know eachother yet. It can be quite interesting for long time colleagues as well. This exercise is intended force people’s brains to take new creative paths by reverse-engineering an unknown product of business from a very simple starting point: its name. Hand out paper sheets with a single fictonal brand names on it. To get you started please take a look at these examples. Have participants write down as many types of products or businesses they think the name may stand for. Have them aim for quantity (a list of more than 15 types of brands and business is not uncommon). This should take about five minutes. Have each participant share his or her best ideas with the other members and discuss. Though this type of exercise works really well when you’re brainstorming for a brand-name it can be quite effective for other types of brainstorms as well. This exercise helps people look for inspiration in new places. It forces their brains to fit different stimili with the creative task at hand. Hand out small stacks of cards with different (inspirational) quotes on them. Have particiapants select the quote that they feel is the most relevant to today’s brainstorm. Have each participant share his or her best ideas with the other group members. I have a stack of about 150 different quotes printed on small cardboard cards – the size of business cards – from different sources (from Einstein to Steve Jobs). Instead of full quotes you can also use pictures or single words. Have participants individually write down as many ideas as they can think of in ten minutes. Note: do not give them any examples. Let them do the work themselves. Have them aim for quantity. They should be able to think of 10 to 20 ideas at least. Have participants share their most interesting ideas with the group and discuss those. I’ve stolen this idea from IDEO’s Tim Brow. The exercise is somewhat similar to the Brick Game. Instead of a riddle they are presented with a piece of paper with 30 circles on it. They have to use as many these circles as possible in different drawings. The ideas behind the exercise is to make people appreciate speed and spontaneity over their desire to be original. 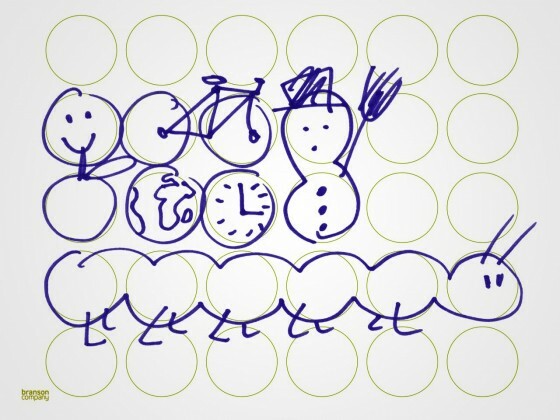 Have participants draw as many different pictures incorporating one, two or more of the circles on the grid. Give them 1 (one!) minute for this exercise. Not everybody uses up all 30 circles. In fact most people don’t. Why? People tend judge their own ideas in their heads before sharing them. In fact, most ideas do not get shared because of people’s desire to be original. This exercise is intended to demonstrate that barrier – and help people overcome it. People who ‘cheat’ by rapidly drawing many variants of a happy face usually fare a lot better than ‘artists’ who try too hard to be original. It may be a good idea to repeat the exercise (or a variant of it) at a later stage during the day and compare the results. When all else fails and energy levels drop: take a walk. 15 minutes of fresh air can do wonders. You don’t even have to be in a pretty environment. To make sure participants really get their mind of things assign them with a task such as a scavenger hunt (steal something, find three sources of inspiration). Talking a walk is always a good idea after (or during) lunch. People’s energy levels tend to decrease a bit right after a meal. This exercise is one of the hardest to pull off, but when executed well it can do wonders. It works particularly well after a break (a lunch break for example or a good night of sleep). When the participans enter the room, say nothing. Use a powerpoint like this example to communicate with them. When participants sit down (in silence), pair them up (in silence). They must do this this without talking. Without writing. Without drawing. Watch for about 3 minutes as people frantically sign, mime or even dance their message to each-other. Besides teaching people to communicate and truly pay attention to each other the physical nature of the exercise helps people and their brains get active. I should mention that I stole this great exercise from Shlomit Tassa from the SIT institute. Please note that discussing not just the results of the exercises but also what happened to the participants during the exercises is very important too. What insights and realizations about their own thinking processes and creativity occurred to them? For example you need to explain and discuss what the 30 circles exercise demonstrates about people’s thinking pattern to make people realize what they can do to actively change the way their brains function. Of course there are many more exercises to get people warmed up. 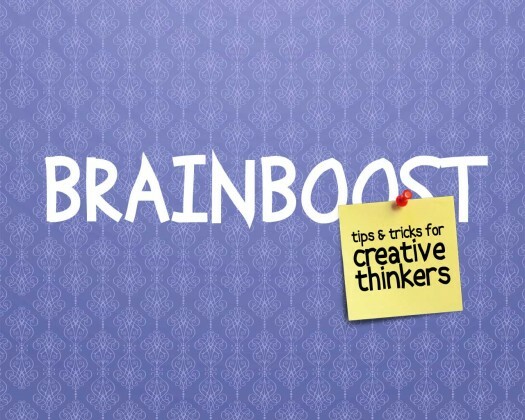 But this Brainboost set should help you out in most brain storm sessions. Feel free to steal (and adapt) any of my ideas for your next brain storm or share them with others. Please do share the results we me. Any other feedback or input will also be much appreciated. Thank you for some great ideas! !